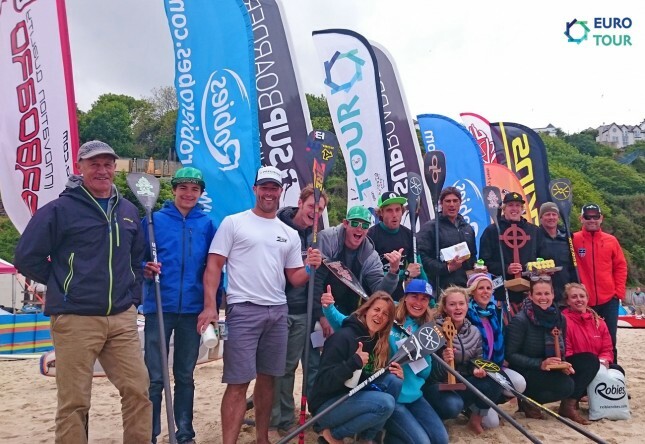 Starboard duo Connor Baxter and Fiona Wylde have taken out the inaugural St’Ives Bay Celtic Cup, triumphing in challenging conditions in Week 2 of the Euro Tour. After paddlers were greeted with glorious sunshine here in Cornwall this morning, the British weather gods did their thing and introduced a combination of overcast skies and howling winds before the race started. That left competitors battling a long distance course that included both upwind and downwind legs, which made for a see-sawing battle among the top contenders. At the completion of the three long laps, which covered 13km in total, it was Connor Baxter once again crossing the line in first. However the main chase pack was never too far behind, and the gap at the finish was a mere six seconds. Leading the charge and coming home runner-up was Fernando Stalla, with the Rogue team rider outlasting up-and-coming Italian Paolo Marconi (Jimmy Lewis). That made for an all-international podium, however the next six spots went to the UK boys. Starboard’s Paul Simmons recovered from a horror start to sit in the front pack for most of the race, finally getting one over his compatriot Ryan James (Mistral) at the line. 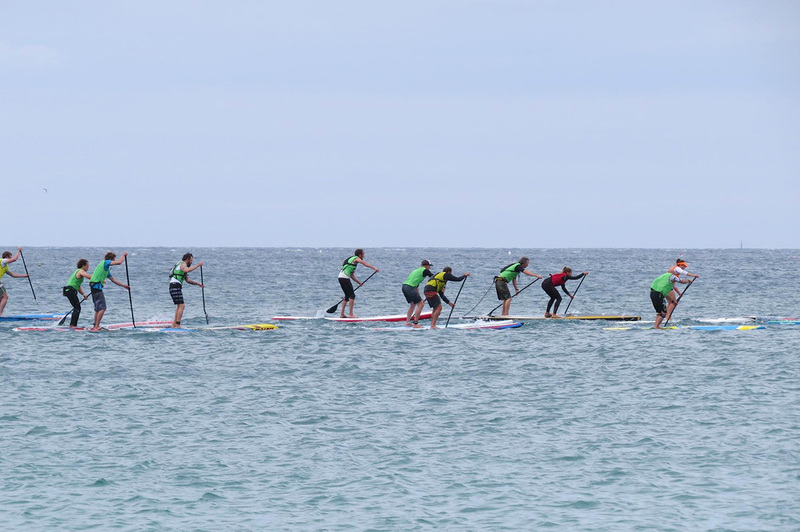 Jersey boy Aaron Rowe, paddling a freakishly-narrow, 21 inch wide Lokahi board, came home in 6th ahead of BIC’s Pete Holliday, a tiring Ollie Shilston (Surftech) in 8th and Mark Slater (Fanatic) 9th. The Mad Scientist from Quickblade Paddles, Jim Terrell, rounded out the Top 10. In the women’s it was Starboard young gun Fiona Wylde all the way. The Hood River native was relishing the downwind leg on the back straight, and indeed at one point actually threatened the top 10 men. Fiona faded slightly in the upwind section on each of the 3x 4km laps, however she was still well clear of Starboard team mate Marie Buchanan at the line. Spain’s Susak Molinero, the Jimmy Lewis team mate (and partner) of Paolo Marconi, picked up her second podium in as many weeks by finishing third. Fiona has shown tremendous form over the 12 months, highlighted by her world number four ranking, and will be one of the contenders at next week’s big Lost Mills showdown in Germany. It was definitely a challenging race but also a very entertaining one. Despite his prowess in the bumps, Connor’s victory was never secure after the chase group gained ground on every upwind leg. 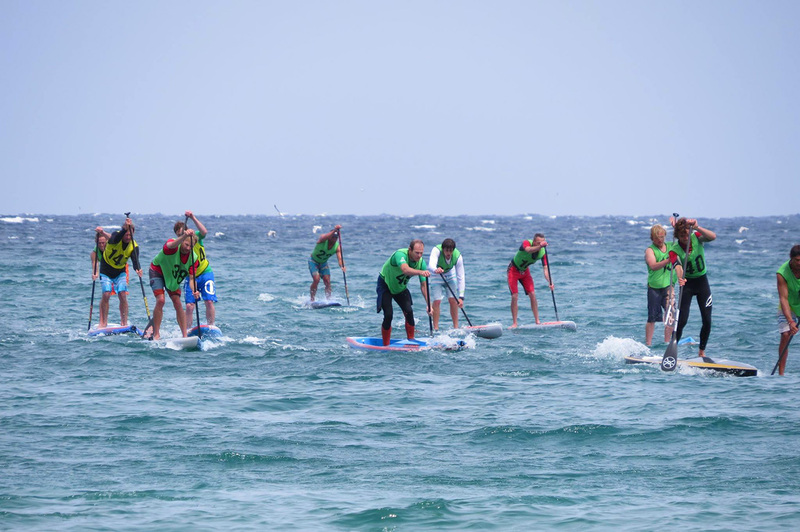 There were personal battles all the way down the order as well, as the conditions put drafting at a premium and made virtually every paddler work for themselves. Here’s some classic drone footage from the race start (that’s Paolo Marconi face-planting it – the Italian did a great job to quickly recover and work his way back to the front). Also a big thanks to Starboard SUP UK for hooking me up with a race board at the last second! 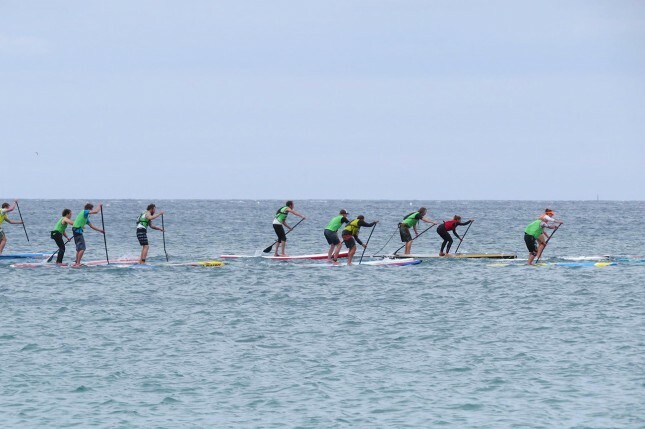 I paddled the 14’x23″ Sprint for the record – worked pretty good even in the wobbly conditions. It was a good weekend all round for Starboard: Aside from their international stars Connor and Fiona taking the wins, Starboard had two of the top three women and four of the top 11 men. SUNDAY UPDATE: After a few too many celebratory ciders in St. Ives last night, we headed back down to the beach in Carbis Bay for a Sunday Funday. With chilly, cloudy, rainy weather greeting us, it was with trepidation that we donned the race jersey and warmed up for the knockout Survivor race. With some of us taking the race less seriously than others (the Starship lifted off! ), it was eventually Connor Baxter taking the win ahead of Fernando Stalla, while Fiona Wylde made it a clean sweep of the women’s. All the points and prize money were on yesterday’s distance race, but this was a fun (and hard fought) way to cap off the event. Sure enough, the sun came blasting through around midday, just after the racing wrapped, with a glorious afternoon ending the event and giving the visiting competitors some great weather to stroll around the picturesque village of St. Ives. This is an amazing little corner of the world, though the weather has definitely been a rollercoaster. All round a great event. 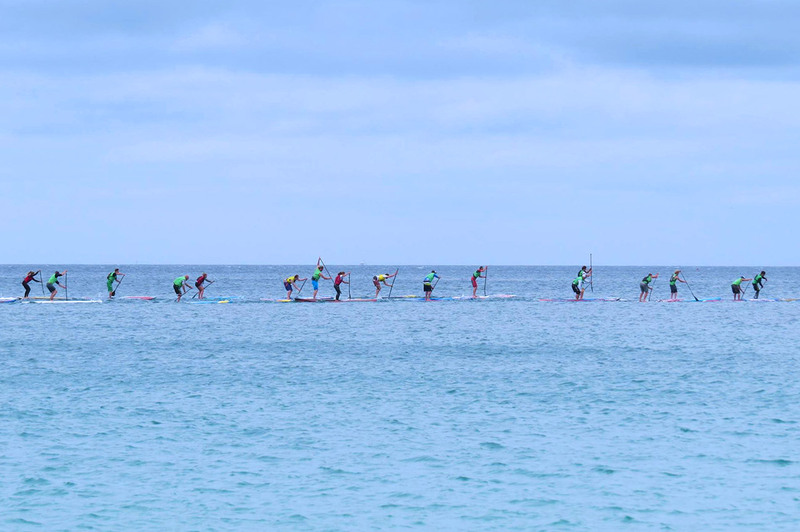 It wasn’t the largest turnout but it’s great to see international SUP racing expanding to new frontiers. We all felt like pioneers in an outpost station this weekend, and I hope we helped lay the foundation for a growing SUP community here on the south west tip of England. Full results from the elite distance race below.